Copyright: © 2017 Matthews MR, et al. This is an open-access article distributed under the terms of the Creative Commons Attribution License, which permits unrestricted use, distribution, and reproduction in any medium, provided the original author and source are credited. Background: Aerial, infrared countermeasure flares are used by United States Air Force aircraft to lure a live, heatseeking “surface to air” or “air to air” missile as a diversionary tactic to help evade destruction. Unfortunately, an unquantifiable amount of such flares do not deflagrate (ignite) but fall to the ground. They can then be triggered to deflagrate by the subsequent handling of the device. This case report describes an un-deflagrated flare that was triggered by an unsuspecting civilian. The countermeasure flare reached a temperature of 3,400 degrees Fahrenheit, igniting the civilian’s clothes and causing severe burns that subsequently required burn center admission and treatment. Case Report: A 50 year-old female living near a USAF bombing test range inadvertently “picked up” a metallic desert object. There was a subsequent deflagration of the flare burning the patient over 49% of her body. She was transported to the burn center. She underwent seven major operative skin excisions for her third degree burns, followed by subsequent wound closure with skin grafting. After being admitted for over fifty days she was discharged. Discussion: The total burden of unexploded ordinance around the world is very large. While infrared countermeasure flares were designed to have an overall reliability greater than 96.25%, testing has shown that its reliability appears to be much closer to 99%. Handling an un-deflagrated flare is hazardous and must not be attempted. If any such ordinance is found, the individual should leave the ordnance in place and notify the local authorities. Aerial, infrared (IR) countermeasure flares are used by United States Air Force (USAF) aircraft to lure a live, heat-seeking “surface to air” or “air to air” missile away from that aircraft’s engines’ heat signature as a diversionary tactic to help evade certain destruction [1,2]. At a low enough altitude these commonly used metallic ignition flares can also be used as markers over USAF bombing ranges to illuminate where strike aircraft should practice deploying their ballistic armaments. Unfortunately, an unquantifiable amount of such flares will not undergo deflagration (ignition) and fall to the ground as undeflagrated ordnance. This un-deflagrated flare can be triggered by the handling of the device. In spite of using a designated and clearly marked strip of land in remote areas within Arizona for such purposes, the unsuspecting individual may handle or tread over the flare causing an inadvertent deflagration. The flare’s temperature can reach approximately 3,400 degrees Fahrenheit, igniting the person’s clothes and causing severe cutaneous burn damage. 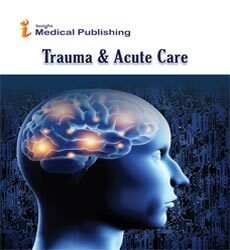 This case report describes such an incident that subsequently required burn center admission and treatment. A 50 year old female living in Eastern Arizona near a USAF bombing test range, inadvertently “picked up” an object laying in the desert marked with “WARNING-USAF IR FLARE EXPLOSIVE/FLAMMABLE” (the only portion of the flare to remain after it deflagrated in the patient’s hands). There was a subsequent flare deflagration and the patient was seen running from the scene with her clothes on fire. The patient sustained a 49% of total body surface area burn including her head, bilateral upper and lower extremities and torso (Figures 1-4). She was intubated in the field and transported to the Arizona Burn Center’s intensive care unit. She underwent seven major operative skin excisions for her deep third degree burns coupled with initial cadaveric allograft coverage. These operations were later followed by wound closure with autografting using a split thickness skin graft technique. The patient was extubated on post-admission day 24. After being admitted for just over fifty days she was discharged to a rehabilitation facility with burn clinic follow-up. Figure 1: Severe burns to the right hand, right upper extremity and also the face requiring intubation to protect the airway. Figure 2: Severe burns to the chest and shoulders with scattered burns to the anterior abdominal wall. 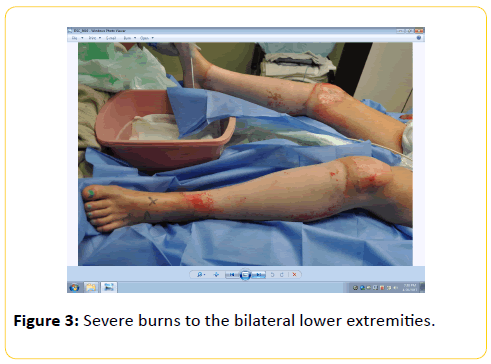 Figure 3: Severe burns to the bilateral lower extremities. Figure 4: Severe burns to the left hand, upper extremity and chest wall as well as to the face. Aerial, infrared, countermeasure flares are used by aircraft as a diversionary tactic to avoid anti-aircraft, “heat-seeking” missiles and also to mark bombing test ranges for a second aircraft to practice dropping or shooting their ordnance in specified eastern Arizona sites. Such has been the routine for the past fifty years dating back to the Vietnam-era, which unfortunately included the area around where this patient lived. Flares used by the USAF are composed of a pyrotechnic composition which is primarily based on burning metal including a mixture of magnesium, Teflon, and Viton (MTV) . These flares weigh about 13 oz and it is estimated that approximately 215,000 flares were used during practice in the mid-1990’s alone . The MJU 7 A/B flare is the most heavily used military flare. Interestingly, there is no known rate of misfires released to the public after being deployed by an aircraft as this information is considered “classified” by the USAF Office of Special Investigation (OSI). Other ground devices such as the M918 40 mm munitions for a grenade launcher designed in the mid 1970’s uses a similar pyrotechnic design and has heavy metal in its fuse as well. It has been studied and may have an unignited rate believed to be 3% to 8% . While the infrared countermeasure flare was designed to have an overall reliability greater than 96.25% (confidence level of 95%) using an Acceptance Quality Level of 1.0 , testing has shown that its reliability appears to be much closer to 99%. Nonetheless, the total burden of unexploded ordnance around the world is very large. In 2010, construction workers in Gottingen, Germany found an Allied 1,100 lb bomb from World War II that was buried 23 ft below the surface of the ground . A German explosive ordnance disposal (EOD) team trying to disarm the bomb sustained an inadvertent detonation killing three individuals and injuring 6 additional individuals. Unexploded or un-deflagrated ordinance may be found on every continent where a modern war has been fought. Most IR countermeasure flares despite their delivery system are airtight before deployment and deflagrate on contact with the air so as not to ignite within an aircraft with predictable devastating results. The pyrophoric flare falls to the ground most typically and as it falls, cools down in the atmosphere and may only look like metallic debris once on the ground. The design of these flares is to have them burn-out well before they touch the ground as the creation of wildfires is a known risk. Unfortunately for this patient, such a flare, albeit un-deflagrated, did reach the ground and the subsequent motion during the handling of the un-deflagrated device may have been enough to trigger the flare to ignite when in contact with the air. This resulted in a powerful exothermic reaction of infrared energy of over a 3,400 degrees Fahrenheit, igniting her clothes and resulting in a 49% of total body surface area burn. The deployed flare MJU-7A/B Aircraft Countermeasure Flare in question did not descend by parachute according to the USAF OSI and they could not estimate when it was deployed as the serial numbers were destroyed when it burned up under the temperature that was so intense that the only piece left was the aforementioned metal tape wrap with its warning. Pictures of the flare’s metallic tape wrap were recognized immediately by the USAF explosive ordinance disposal team and the USAF OSI, and accordingly there was no way of knowing how long it had sat at ground level in the Arizona desert. In addition to this event, it has been reported on the local San Carlos Arizona police officials’ website that other un-deflagrated flares have been found in this portion Eastern Arizona communities (Figure 5) . Handling any ordnance, let alone an un-deflagrated flare, is hazardous and must not be attempted. If any such ordnance is found, the individual should leave the ordnance in place and notify the local authorities immediately. This should then be followed by the prompt contact with the local USAF base’s OSI and the EOD team for subsequent clearance of these incendiary devices to protect the civilian community. Koch EC (2001) Review on Pyrotechnic Aerial Infrared Decoys. Prop Explos Pyrotech 26: 3-11. Koch EC (2006) Pyrotechnic Countermeasures: II. Advanced Aerial Infrared Pyrotechnic Countermeasures. Prop Explos Pyrotech 31: 3-19. Global Security: MJU-7 A/B Decoy Flare (2011) website. Report of the Defence Science Board task Force on Unexploded Ordinance. Office of the Secretary of Defence for Acquisition, Technology and Logistics. (2003): 150. Routine Disposal Goes Wrong: Three Killed in Explosion of World War II Bomb in Germany (2010) Der Spiegel International. The San Carlos Apache Police Department Facebook site (2017).